If you watch movies and TV shows streaming from Netflix on your PC or Mac you may have noticed that we have updated our Web video player. We’ve refreshed the look of the existing features and added some new functionality. Similarly, the player will scale down to smaller windows, which is useful if you want to watch something while working in another window. In our new player, we’ve consolidated controls into one line. We’re also using icons instead of words (see image below). Perhaps the biggest change is to the ‘Back to Browse’ option, which used to sit at the bottom right of the old control bar. We’ve moved this up to the top of the screen and to the left. It’s now an arrow icon and text will explain its functionality when you hover over the arrow with your mouse. 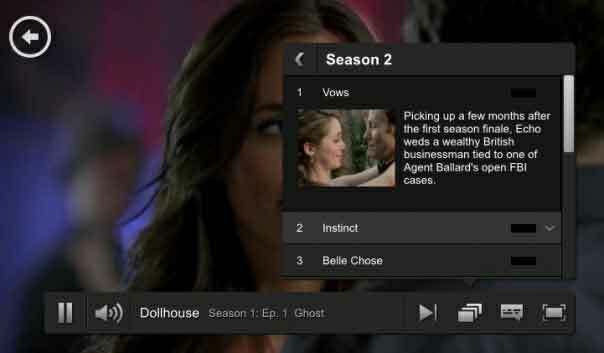 Additional episodes of a TV show can be previewed right from within the player, even in full-screen mode. The player makes way for additional information, lightbox-style, when paused for a few seconds. Netflix this week quietly added just shy of 100 concert films and music documentaries featuring rock and pop legends like the Beatles, Queen, Toto and The Doors to its streaming catalog. The new music content doesn’t exactly make Netflix a Vevo or Wolfgang’s Vault competitor, but it could be a first indicator of music becoming yet another powerful niche for the company. Netflix has steadily been building out powerful niche content for a variety of audiences. The site has seen a huge influx of Korean dramas in recent months, for example, and it has also taken on a large catalog of Anime content — two very distinct categories with very passionate fan bases.